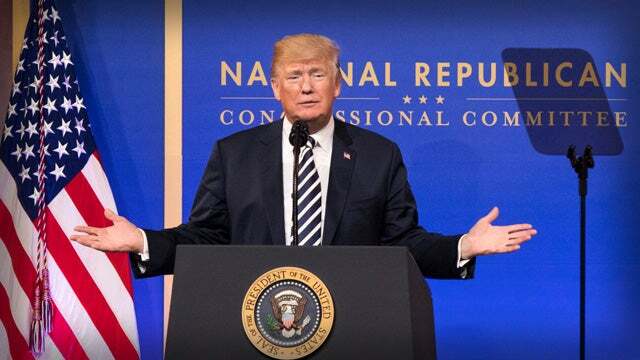 RUSH: So last night President Trump shows up at the National Republican Congressional Committee March dinner. This is the Republican Congressional Campaign Committee and they have one in the Senate, and the Democrats have one in the House and Senate as well. And the purpose of this Republican Congressional Campaign Committee is, of course, to get as many Republicans elected and reelected to the House as possible. And it’s its own separate entity. They do their own separate fundraising. Some coordination, of course, with the RNC, but they pick somebody, a member of the House to head up the committee. It changes every two-year election cycle. I don’t really know what the qualifications are in terms of being appointed to head it up. But it exists, and it’s been around for a long, long time, and it’s traditional that presidents go up and do a speech and an appearance to help the campaign committee raise money. So last night it was Trump who showed up at the Republican Congressional Campaign Committee annual March dinner in Washington, and he was talking about the 2018 midterm elections. I didn’t see it last night. I’m watching highlights and excerpts of it during show prep this morning. As I’m watching this, and, folks, please don’t misunderstand here. I’m not a permanent resident of Egoville. But there are certain things here I could not avoid concluding. I thought I was listening to myself. I mean, it’s uncanny. On certain elements of the speech I knew I was listening to myself. And so we went back to transcribe some archives of this program to match what President Trump said last night. And we have five examples. And I want to share them with you since Hillary’s campaign babe is using my identifier: half her humanity tied behind her back. If Hillary campaigned with half her humanity tied behind her back, she didn’t have any left, because she doesn’t have a full dose to begin with, which has always been her problem. I’m not trying to be funny or exaggerate. That’s Hillary Clinton’s biggest problem. She cannot relate to people. There’s no way Mrs. Clinton could create a bond with her supporters like Donald Trump has. It’s not humanly possible with her. She doesn’t have enough respect for people that she thinks are beneath her. You know the old saw my dad always told me growing up that the way you really find out about a person, one of the quickest ways to learn who a person really is, is to observe how they treat people who cannot do anything for them. And Hillary Clinton treats people like that as though they don’t even exist. That’s why she’s able to make these asinine comments about deplorables and the whole part of the country that’s in red states who don’t contribute anything to the goodness and greatness of America, in her mind. She literally has an arrogant, condescending attitude toward people she thinks are beneath her. And it comes across. There’s no way that Hillary Clinton would ever have anywhere near enough humanity to actually establish a personal bond. She may attract people that have an ideological bond and a vested interest in her winning because of what it’s gonna mean to them, but not because they want something good had to happen to her. And Trump’s bond is all about people supporting Trump because they want good things to happen to him because, in their minds, he deserves it, and he’s out fighting for good things to happen to them as well. And you have to have empathy, and you have to have humanity to pull that off. She just doesn’t. Anyway, back to Trump’s speech. Here’s what we’re gonna do. We’re gonna play a segment, a brief sound bite of something I have said, and then we’re gonna find where Trump said something similar in a speech to the Republican Congressional Campaign Committee last night. We start with a comment I made on Valentine’s Day, February 14th. RUSH ARCHIVE: There is no way under the sun the Democrats ought to be winning a single election. With the economy alone, with the tax cuts alone, there is no reason for the Democrats to be winning any elections. RUSH: This is what Trump said. THE PRESIDENT: There’s no reason why we shouldn’t win with what we’ve done over the last year, no reason whatsoever. RUSH: And there isn’t a reason! There’s no reason people would be voting for Democrat, not based on the substance of what’s happening in America in terms of things that are improving people’s lives. Okay. That’s example No. 1. Next page. Here I am from March the 16th. Five days ago I was talking about the Democrat candidate Conor Lamb doing well in the special election in Pennsylvania district No. 18. RUSH ARCHIVE: Don’t tell me that we have conservative Democrats. There is no such animal, particularly today. How do they vote on Big Government? How do they vote on spending? How do they vote on all of these traditional things? How do they vote on abortion? I guarantee you that when the pedal meets the road, when the rubber meets the road, pedal hits the metal, these people are voting Democrat. They’re voting Pelosi. They are voting Schumer. RUSH: Here is what Trump said. THE PRESIDENT: It doesn’t matter what Democrat candidates say on the campaign trail, because once Democrats get to Washington, they always do the same thing. They vote for the liberal Pelosi agenda, down the line, straight down the line every single time. They will never vote for us. They will never vote for what’s right. These days, there’s no such thing as a Blue Dog Democrat. RUSH: There’s no such thing as a conservative Democrat. And there’s Trump: There’s no such thing as a Blue Dog Democrat. And I say: No matter what they say on the campaign trail they vote for the leadership. Trump said the same thing. Here I am on March 13th. So this is eight days ago. Oh, by the way, one thing about Conor Lamb. As everybody’s worried about what’s gonna happen if the Democrats start running a bunch of guys like that, a bunch of people that are Democrats claiming to support the Trump agenda, those people are never gonna win primaries. Conor Lamb didn’t have to win a primary. This is very important to realize. If Conor needed to win a primary and was running against a traditional, left-wing radical Democrat, he would not have won. Do not think the Democrats can score big here by running a bunch of Conor Lamb imitators, ’cause they’re gonna get creamed by dyed-in-the-wool radical leftist Democrats if there is a primary involved. Okay, back now to me. This is March 13th, eight days ago. Well, this is what I said. Listen to what I said first. I’m summarizing what I said, but this is actually it from March the 13th. RUSH ARCHIVE: He’s realized this. I think Trump’s learning a lot about liberalism that he didn’t know — I think Trump is learning a lot about leftists that he didn’t know — because Trump is becoming more conservative instinctively as he goes. THE PRESIDENT: It’s never been this clear! The Democrats used to be somewhat in the middle, and now what happened is they just moved. They just moved. They’re going so far to the left-hand side of the equation — they have gone so far left — we have to go a little bit further right. RUSH: I said, “We have to be more conservative. We have to pile on the conservatism,” and there’s Trump saying we have to move further to the right. So those are the examples that we were able to find in a hurry. 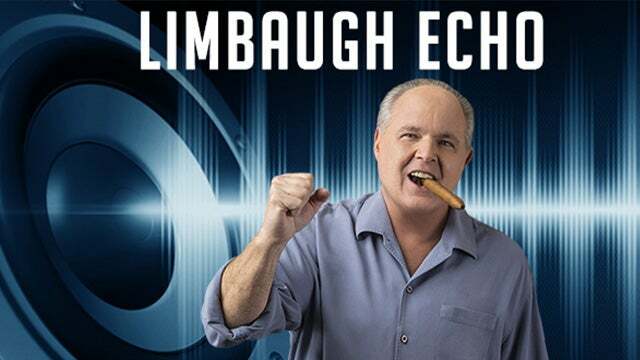 I’ve always had people say, “You know, Rush, I’ve heard Trump. He listens to you.” Trump watches TV. He doesn’t listen to radio. He may have people that do and so forth. But, anyway, I just wanted to share that with you because it’s good. It’s good, folks, that he’s saying this stuff, that he thinks this stuff, that he is figuring this stuff out and learning it.